Besides writing about taxes here on My Financial Reviews and Couple Money, I also regularly write for TurboTax’s blog. I thought it would be also very useful to collect my tax posts from around the web so you can have a post you can use as a reference for some questions you may have about getting your taxes done. Have the Correct Filing Status on Your Tax Return-> It sounds basic, but making sure you have the correct filing status can make a huge difference on the deductions and credits you can claim. Tracking Your Tax Refund-> If you are expecting a tax refund, you want to know where your money is; here’s the IRS page you can go to check on the status of your return and refund. Don’t Forget to Pay Estimated Taxes!-> Besides getting your federal return done, if you’re self-employed or freelance, you need to make sure you pay estimated taxes. Get More Money in Your Paycheck: Calculate Your W-4 Withholding-> If you don’t want to wait for a big refund check next year, you can adjust your withholdings now and get a slightly bigger paycheck throughout this year. 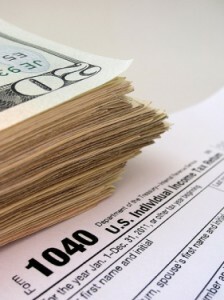 Take Advantage of Tax Credits and Deductions-> What you claim for deductions and credits can help decrease your tax liability and in some cases, increase your tax refund. Still Time to Open and Fund Your IRA Before April 15th-> If you haven’t fully funded your IRA and you still haven’t filed your taxes, now is a great time to contribute. What’s Taxable Income?-> Not all of you income is necessarily taxable, find ways to lower your taxable income. Getting All of My 1099s In->If you’re self-employed or if you hired contractors the previous year, becoming familiar with the 1099-MISC can make your life much easier. What Do New Parents Need to Know About Taxes?->This year when we filed our taxes we had a new variable to consider – our baby girl. Tax Brackets and Effective Tax Rates-> If you’re looking at calculating your effect tax rate, please check out this post. What Medical Expenses Can I Deduct?-> You can deduct your medical expenses, your spouse’s expenses (provided you’re filing jointly), or your dependent’s. Most Overlooked Tax Deductions->Here are a few overlooked tax deductions that people miss out on. I’ll group them by home, and finally business. How Do I Deduct Points Paid on My Mortgage?->Besides the financial benefits of owning property with some equity, there are some tax advantages, including deducting points on your mortgage. TurboTax also has a team of tax experts writing on their blog, so if you have a very specific tax question, please leave a comment on their site. If you want to get started on your taxes, grab your copy of TurboTax today!